Lungs from asthma patients respond in an exaggerated manner by being exposed to pollen, infections, cold, smoke, contamination, etc. This stimuli cause swollen bronchial tubes and reduced size, which lead to the symptoms described. There’s a balance between our sympathetic nervous system and parasympathetic, which maintains our airway with minimal changes during the day. This balance is kept by our internal clock or heart rate. By night there’s a reduction in the size of our bronchi, but for patients with asthma this reduction is greater, causing more symptoms at night. The symptoms at night cause sleep to be of less quality, therefore the patient feels tired during the day, because asthma symptoms will reduce sleep time, deep sleep will be less and they will wake up frequently because of wheezing, coughing or breathlessness. If these incidents occur several nights in a row, it will impact performance during the day, your abilities will be diminished therefore there will be a greater chance of an accident at work, driving and other places and if you’re a student, school performance will be affected as well. When symptoms are severe, oxygen levels in blood are reduced and can be so dangerously low, they cause several sleep interruptions during the night. 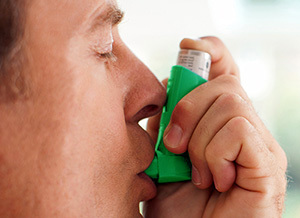 If you suffer from asthma and your sleep pattern is abnormal you must get medical attention. Generally this annoyance presented during sleep is a signal of an inadequate control of asthma. If there is an adequate control but you suffer these symptoms you probably need some treatment adjustments. These medicines are used in combination and achieve an adequate effect for 24 hours and it’s possible to sleep without symptoms and have a successful sleep, wake up recovered and ready for the day. If you suffer from these symptoms, go to your doctor since you’re probably not taking your medicines the right way or the medicines themselves are not the best ones.